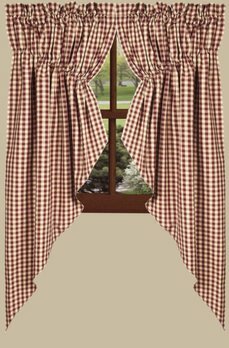 Heritage House Valance - Barn Red with khaki check design. Use multiple panels for wider windows. Lined. Dry Clean for best results. 72" x 15.5". 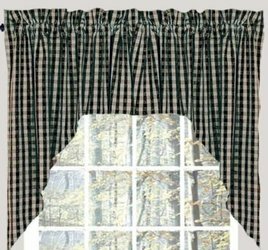 Heritage House Valance - Black with khaki check design. Use multiple panels for wider windows. Lined. Dry Clean for best results. 72" x 15.5". Straight hem. 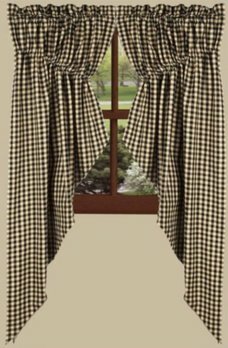 Heritage House Check Fairfield Valance. 72 Wide x 15-1/2in Long. Choose between black or barn red check, each combined with nutmeg checks of 1/2in. 100% Cotton. Fully Lined. Length includes 2in header and 2-1/2in rod pocket. 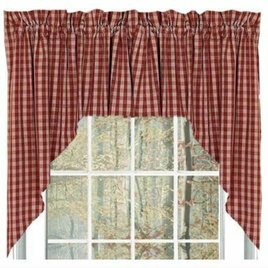 The Heritage House Barn Red Swag is an adorable woven fabric in red & tan gingham that is so versatile. Charming on their own, or pair with coordinating tiers for a more dramatic appeal! Heritage House Check Black Swag brings a traditional country check in black on khaki. This swag is full lined and made of 100% cotton. 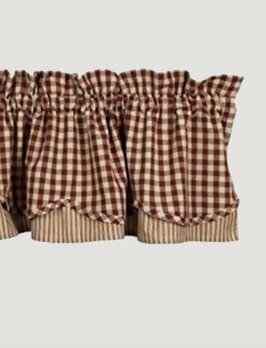 The Heritage House Gathered Barn Red Swag is a pretty red & tan gingham swag perfect for any country decor! This cozy blend provides a beautiful backdrop while perfectly framing your window! Charming on their own, or with tiers for a more dramatic look! 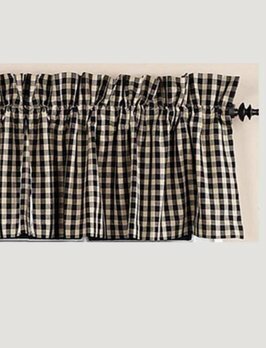 The Heritage House Gathered Swag Black looks beautiful on a window in your cozy home! The fabric colors of black and nutmeg warm up any room. 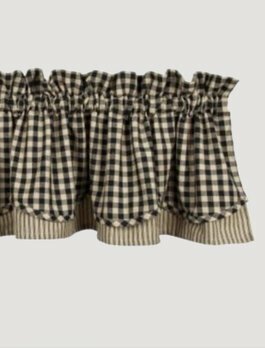 This fully lined, awesome Country Style Gathered swag, is 72″ wide by 63″ long per pair, made of 100% cotton! 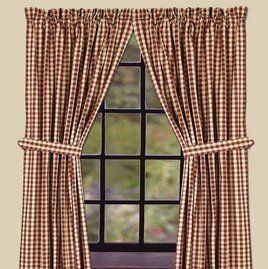 Bring a finishing touch to your farmhouse with the Heritage House Check 63" Red Panels. Made of cotton and measures 72" x 63" (2 pcs). 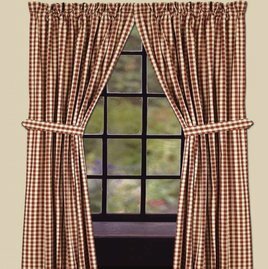 Both curtains are fully lined with a 2" header and a 2.5" rod pocket. Part of the Heritage House Collection.